Karlacti all natural, authentic handmade Mediterranean cheeses and dairy products are produced in accordance to healthy Mediterranean diet principles and by the old country methods and Baghdassarian family recipes, in the USA and Canada, from first quality milk, according to strict quality standards. This insures that our authentic handmade specialty Mediterranean cheeses retain all the traditional qualities necessary in a healthy Mediterranean diet, a diet rich in nutritious all natural cheeses. 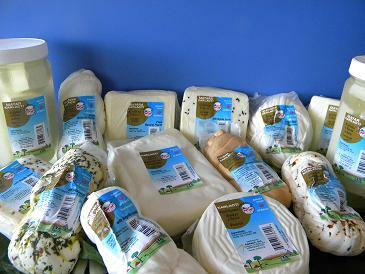 In fact, one of the constituents of the Mediterranean diet is white cheese. White cheeses are fresh cheeses easier to digest than yellow cheeses. White cheeses are low in fat, cholesterol and calories with a distinctive agreeable flavor and soft texture. A typical Mediterranean breakfast consists of white cheese, olives, honey and fresh bread. KARLACTI line of authentic handmade Middle Eastern dairy products includes fresh hand braided string cheese, akkawi, grilling, Syrian and Mediterranean Nabulsi cheeses in addition to Mediterranean string cheese. Middle Eastern Specialty cheese dairy products company, Karlacti, Inc. is rooted in its Armenian Mediterranean food culture authentic historic heritage and 84 years of pioneering history of its licensor, Karoun Dairies, a world famous Mideastern cheese and dairy products company.